What you’re looking at here, my friends, is a baby Paperbark Maple (Acer griseum) which (in case you’ve been living in Antarctica or something) you know is one one of the most coveted of ornamental trees. Well, the minute I saw this little guy I knew it was coming home with me. When I worked at a local nursery a few years ago, 5 to 6 foot specimens of A. griseum were selling for close to five hundred Big Ones. They must be a bit more readily available now, and I know this one is a runt, but I couldn’t walk away from the $15 price tag. Plus, if you look closely at the tiny little trunk, you can see the bark already exfoliating! Awwww! Never mind that I have no place to put it. No sir, not even close! I’ve already used up the three sunniest locations in my backyard with other ornamental trees that I yearned for (a river birch, a silverbell, and a sweetbay magnolia). And my front yard is spoken for as well. It already contains two large trees and three small ones. To try to throw the new Acer into the mix would just be disrespectful to all involved. So I’m doing the noble thing and giving it away to a family that can give it a decent chance in life (my mom and dad). Their backyard has the sun and space that I simply cannot offer it at this point in my life. It pains me to give it up, but I know I am doing the right thing and giving it the greatest chance to fulfill its destiny! Plus, maybe my parents will let me come over and water it sometimes. Sniff. This entry was posted in trees and tagged Acer griseum, green spring gardens, Paperbark Maple by Mary Gray. Bookmark the permalink. It will grow to know you as doting Aunt Mary. Then, when it learns the shocking truth, the two of you can have an emotional confrontation. Finally, sadder but wiser, you will establish a new, more loving relationship based on mutual acceptance and understanding. Nothing’s wrong, I just got something in my eye. And pass the kleenex, please. ha! You outdid me on that one. Too funny! That’s an easy one. Chuck the river birch unless it’s a Fox Valley, and plant the A. griseum instead. Oooooh, that’s tempting, Susanna, since my river birch is the saddest looking specimen you’ve ever seen. It’s a Heritage, but since I spent more on that tree than any single plant ever, I’m not ready to abandon it just yet. I couldn’t resist a pair of free, bare-root tulip poplars this spring. I potted them up and hope that the two new couples in the neighborhood will accept them as housewarming gifts next arbor day. You are so funny. If I didn’t look at the picture, I would be sure you were talking about the cutest, rare puppy you rescued from a shelter. Absolutely love the post, Mary! Oh, oh!!! It can come live here right next to the fig leaved magnolia I HAD to buy when I finally saw one for sale this spring….He/she definitely doesn’t think I’m watering her/him enough!!! 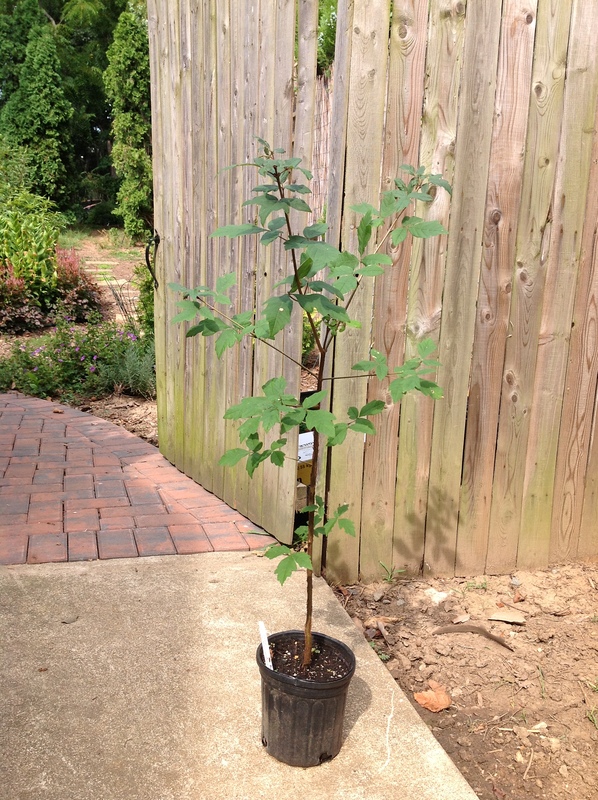 Acer griseum certainly is coveted, and you scored a wonderful find at that size and price! But I have to say I have never seen a paperbark maple that had a nice form. And I have one, my neighbors have them, and all the public gardens I visit grow them. I’ve seen many! Beautiful bark, and that’s the reason to have one, but the branching is stiffly awkward, the fall (and spring) leaf color is a rusty muddy color, and they rarely have a nice shape. But the bark . . . oooh. This is very true about the form. I was totally counting on the fall color, though, and am disappointed to hear it can be “muddy”….yuck! If you find another one at such a good price, I would keep it as a (big) pot plant. I gave my parents a little A. griseum many years ago, and it’s still pretty small. How’s your sweetbay magnolia? I brought one home from Hechingers sideways across the backseat of our Honda Accord when we first bought our old house. When we sold 7 years later, it was as tall as the house. They are great native trees. The container is an interesting idea! I may go back and see if they have more! I loooove my sweet bay. It’s one of my best performing trees. And wow, I haven’t thought about hechinger’s in years…. Mary, I was starting to feel pangs of jealousy until you said you adopted it out…very selfless of you. It sure is a cutie. You know how kind-spirited I am. Now, if my parents kill it I am going to disown them…. Only tangentially related,but I wish Green Spring Gardens would list online what they have available in the back for sale. Even if they only did it once a month they could significantly up their sales. I just did this exact same thing with a runty coral bark maple! I’m glad I”m not the only person who does this. Oooh, there’s another swell tree. Way to spread the love!